Sergimmo's should change their name to "Italy on 9th". This salumeria is small, rustic, and the sandwiches mirror what you'd find in a corner shop on a street in Venice, except probably twice the size - which is due to this being America and all. My mom and I came to this glorious shop before we headed off the the taping of "Beat Bobby Flay" (why, yes, I was invited to a live taping of the show by Bobby Flay himself!) on a suggestion from my bff Jessica (who saw it on Yelp). My mom and I both took a bus up to the city, and where the busses dropped each one of us off, Sergimmo was about a 10 minute walk, on 9th Avenue, between 35th and 36th Streets. My mom and I both got the same thing, except I can never, ever get anything how it was intended, I always have to doctor it up. The "Di Franchesca" was piled high with a chicken cutlet, fresh mozzarella cheese, sweet cherry peppers, and artichokes, with a balsamic glaze. I added prosciutto to mine, of course. I also saw arancini on the menu for $3.50 each, so I ordered three of those, because they're my absolute favorite. 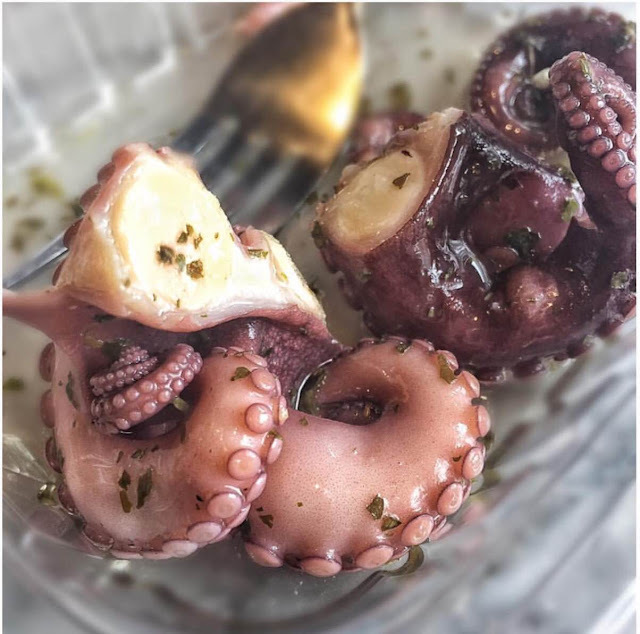 And juuuust as I was leaving the counter, I saw marinated octopus and ordered a quarter-pound of that, too. I'm sure these guys thought I was going to the electric chair in an hour and was never going to eat again. $40.00 later and we were sitting by the window, waiting for Italy to be served. We got our octopus immediately and scarfed that down. It was a bit on the tough side, but the marinade was simple and tasty: olive oil, fresh herbs, vinegar. We both received our sandwiches, and MY GOD YES. The bread. The cheese. The cutlet. Every piece stacked was better than the last. While the chicken cutlet could have withstood a lot more seasoning in it's breading, the salt from the prosciutto and tangy balsamic helped it along. The bread was crusty and fresh, and all the components worked perfectly. The best thing about the sandwich is the fact that I (and my mom!) couldn't finish it all. The longer it sat, wrapped up in it's doggie bag, the better and better it was getting. Of course I got to take my mom's leftovers with me, and I ate the rest on the bus-ride home, as well as the next day! About halfway through our sandwiches, I remembered that we were waiting for arancini. The guys behind the counter assured me they were working on it, and they'd be out shortly. It seemed like a particularly long time for a few rice balls, but I didn't complain. And it's a good thing I did not. The arancini that came on this plate were not your normal arancini. These babies aren't bite-sized. They're barely even fork-sized. I wanted to apologize to the guys behind the counter for even asking for the whereabouts of my rice balls prematurely. The crispy, golden-brown rice balls were probably the size of a baseball, and once you dove in, they were filled with creamy risotto, green peas, a blend of ground meat: most likely pork, beef, and veal (that's unconfirmed, though! ), a touch of sweet tomato sauce, and parmesan cheese. They were served alongside a dish of marinara for dipping, but they were fine without. They needed a pinch of salt, which I happily added, and I polished off almost two of these, Mom eating the rest. Before getting the rice balls, I thought $3.50 was a lot for one, but I chalked it up to it being New York City, the most expensive place on the planet. Turns out, $3.50 is a supremely huge bargain for what you get here. Yum! Sergimmo is the perfect New York sandwich joint, but taken to the next level, with its pasta dishes, pizza, sliced deli meats, and homemade desserts. It's not overpriced, it's not pretentious, and it doesn't pretend to be something it's not. The guys behind the counter seem to speak a little broken English, and seem very authentic. 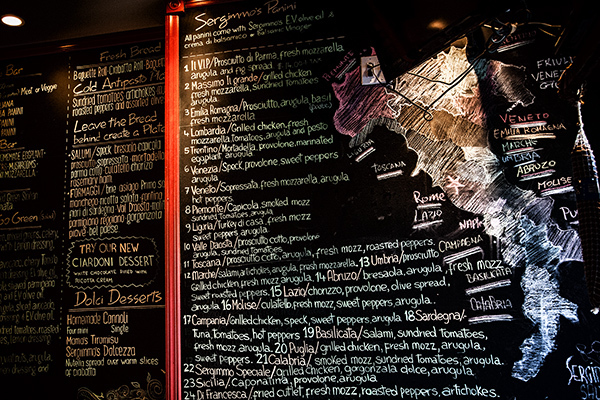 Sergimmo is a place that I would frequent on a regular basis if I lived in New York. I guess it's a good thing I don't, or they'd have to roll me out of there eventually. While I don't get up to NYC every other week, I do go a few times a year. Sergimmo may have just increased "a few" to "a lot". Thanks, Sergio and Massimo!